found in Leeds home bargain. was a good deal I bought one. says it is down from £12. I got a pink zapper one4all, didn't work on my daughters bush though. Only cost £1.50 from same place. this one works well, using on my girlfriends Samsung LCD so all good. 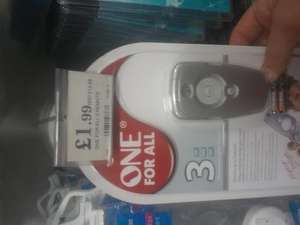 wouldn't have bought a remote from their but it is from one for all and everything I have bought from that brand has worked well. it was about a tenner in asda so saved me some money. I got a pink zapper one4all, didn't work on my daughters bush though. … I got a pink zapper one4all, didn't work on my daughters bush though. Only cost £1.50 from same place. There are so many smutty replies to that post...............(_;) But I'm too much of a gentleman to use them. set up to find the codes? because i have 2 tvs that i cant find the codes for. yes, the instructions where easy and I got it setup in about 5 minutes. comes with a comprehensive list of codes and if the codes don't work a manual way round. yes, the instructions where easy and I got it setup in about 5 minutes. … yes, the instructions where easy and I got it setup in about 5 minutes. comes with a comprehensive list of codes and if the codes don't work a manual way round. so you can set it to work if you havnt the code? I'm not sure. it has a method that tries all the codes the remote knows until it finds it (that's what I understood from the instructions). Bought the £ 2 99 one in Old Swan last week but tried all 22 codes in the 90 page manual for my Toshiba & still didn't work! Took it back for refund & got a remote already programmed for my tv from ebay! Can't go far wrong at this price. There are so many smutty replies to that post...............(_;) But I'm … There are so many smutty replies to that post...............(_;) But I'm too much of a gentleman to use them. Bought one a few weeks back and coded-up/works fine. Bargain for two quid after the dogs nom'd the original.